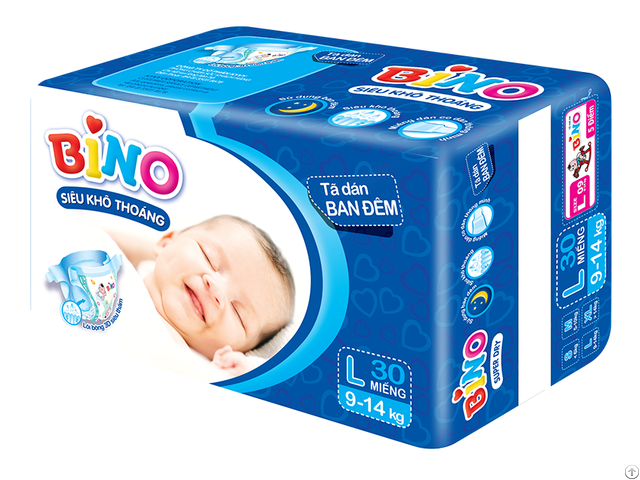 Baby needs to sleep well to grow healthy and happy.BINO for Night, Is produced with modern fashionable shape to bring the comfort for your lovely baby all night. 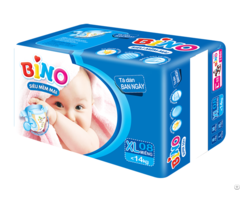 • Super absorbent core: Absorbent polymer enhance to enable urine soak into core quickly and keep baby sleep well all night. 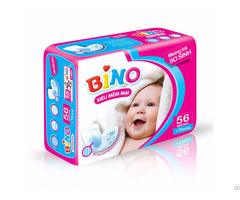 • Breathable back-sheet: Silky soft and breathable back-sheet to release moisture to keep babys skin dry and prevent rash. • Stretchy velcro tapes: Perfect combination between super soft magic tapes and stretchy elastic non-woven to allow to refasten several times and to be comfortable for baby in moving. 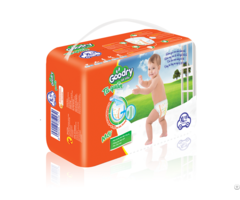 • Ultra soft top-sheet: Soft and ventilated top-sheet is designed with a lots of absorbent slots to keep babys skin always dry and cool. • Leg elastic: Soft elastic material to help baby move easily without scuffing on babys skin.